I was just wondering today – how is it with good deeds? Is altruism, as some claim highest form of egoism? And does it really matter anyway. When you do something good for someone, yes, it makes you feel great, so it would be about you, but when you helped someone and they are happy, it is to mutual benefit. I think like in nature, there always has to be balance and there is no good without evil, no peace without conflict and there are always two if not more sides to the story. I quickly browsed through their website and what they do looks really amazing. 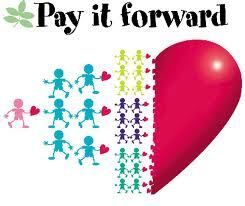 I wonder how great our world would have been if we all decided to “Pay it forward”. We would create a completely different planet and with such little effort, just do something nice to 3 people every time we receive good and ask those we pay it forward to do the same – what amazing impact it would have had. I don’t know how many of you are familiar with the idea of 2012 being a year of awakening of human race and the era of human consciousness shifting. Whatever it might be for you or you choose to believe I hope it’s positive. I think and wish, that the world is changing for the better as humans start to understand and appreciate the idea of love, kindness and just pure being. I noticed how more and more people become aware of their power and start taking responsibility for their lives and choose the enlightened path. Just close your eyes for a second and imagine people just being nice, pleasant, open, polite, honest, it’s mind blowing. Maybe imagine businesses where people create products and services in harmony, enjoying each others company, without wishing each other wrong, not being mean or jealous. Yes, I like that and I think in certain businesses it’s absolutely possible. I work in networking and that is the basic idea – I help you, you help someone else – your business works. It’s just like bringing up a family, you want to give all you’ve got to your children, so they can prosper and develop, you help them grow and enjoy their successes. In the world of fierce competition, ego and suspicion, that is tough to comprehend, but as we evolve I think it will become more and more possible to prosper helping, paying it forward and build structures of people who support and love what they do.